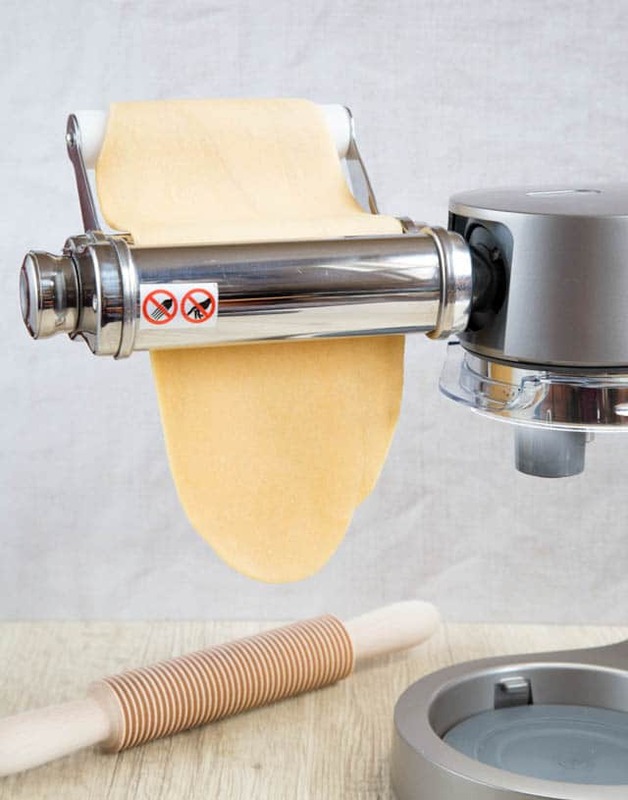 How To Make Fresh Pasta With A Stand Mixer. Save money and time by batch cooking. Fresh, homemade pasta made with a stand mixer is quick to make, easier than you think, delicious, and stores well in the freezer. Perfect for healthy, home made suppers! Batch cooking is a great way of saving time and money, and lends itself to all sorts of dishes. There are the obvious things, like a casserole or hearty soup, where doubling the amounts and chilling/freezing the extra for a later day is a no-brainer. But there are other areas where whipping up a big batch can save time and money at a later date. This fresh pasta is a perfect example, and so easy to make with a stand mixer. Home made pasta uses only flour, eggs, and a dash of salt. 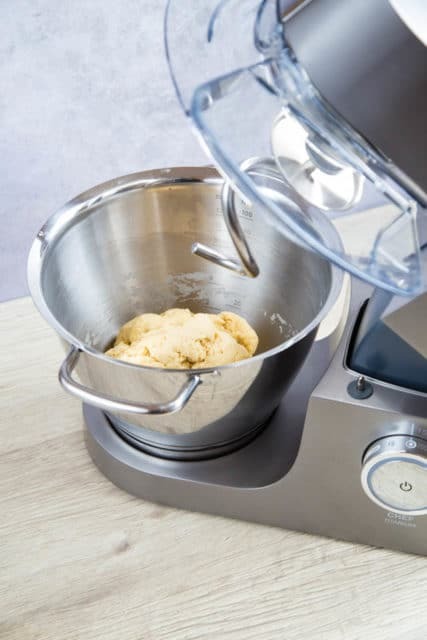 The main requirement is to give the dough a really good knead, and it’s here that a stand mixer like the powerful Kenwood Chef Titanium really makes a difference. How do I make fresh pasta? How do I cut pasta? How do I store homemade fresh pasta? Can I freeze homemade fresh pasta? Just add all the ingredients to the machine, switch it on to the lowest setting and let the dough come together. Then turn it up a couple of settings and let the machine take the strain and knead for about five minutes. Once the dough is ready it is time to roll it, you can do this by hand with a rolling pin, or with a hand cranked pasta roller. But of course a powered machine makes things far easier. 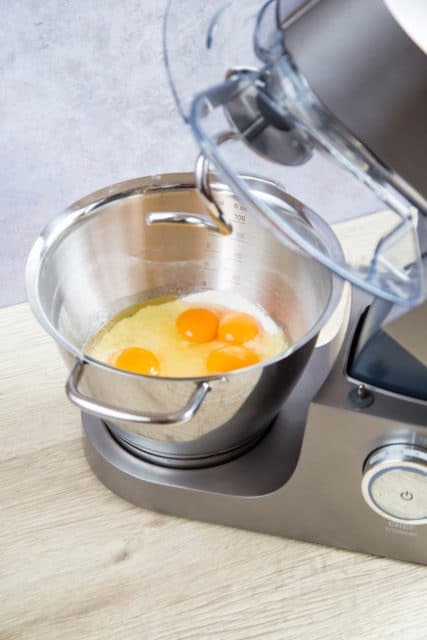 We use the pasta attachment on the slow outlet on the Kenwood Chef Titanium. 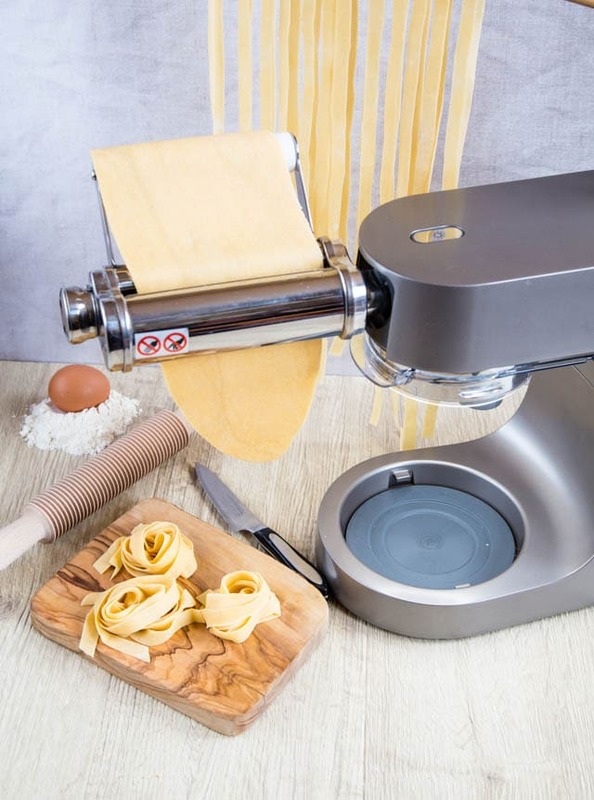 To use a pasta maker, flatten the dough by hand or a rolling pin until it’s about 1 cm thick and easy to feed into the widest setting on the pasta machine. Pass it through the pasta machine a couple of times on each thickness setting, running the machine at a medium to slow setting. Once down to the second thinnest setting it’s ready to cut into tagliatelle. As the pasta gets thinner the sheet gets longer and longer, you may need to cut it in half for ease of handling. 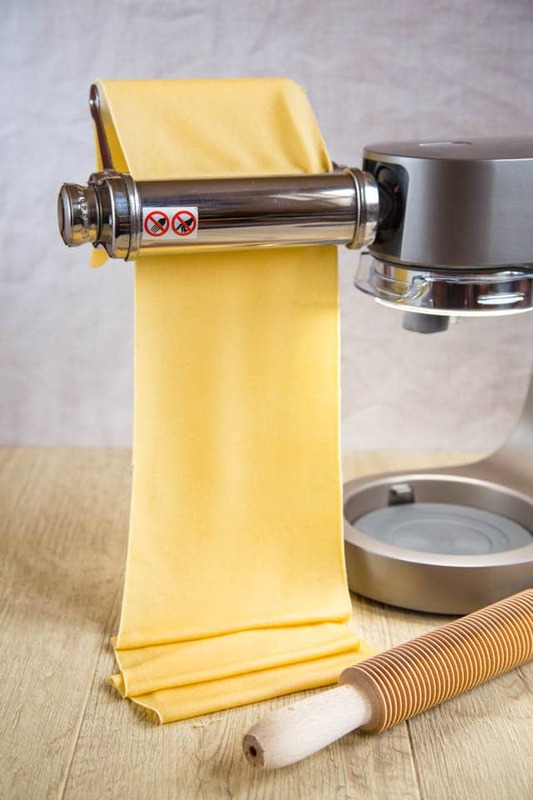 You can buy roller pasta cutters, or even a specific pasta cutter that fits to your stand mixer, but for occasional use, it’s easy to lightly dust the freshly made pasta with a little flour, roll it up and cut into strips, and then immediately unroll. Hang the pasta to dry for 30minutes or so (we use a coat hanger) then roll into nests. The wooden rolling pin-like cutters; despite the fact that they look really pretty (we bought one for this recipe), really do not cut at all. I recommend that you don’t bother with one. Freshly rolled and cut pasta will keep in the fridge for about 18 hours. Beyond that time, the iron in the egg yolk oxidizes, and the pasta acquires an unappetizing grey-green colour. Commercial plastic packs of fresh pasta are filled with nitrogen, but making your own pasta cuts down on the single use plastic packaging. Pack rollled and cut fresh pasta into a plastic bag and seal, or pop into a plastic box. If, like us, you’re always a little short on freezer space then freeze the kneaded but unrolled dough, and defrost roll out as needed. It will keep for a month or so, making pasta a perfect candidate for batch cooking. Unlike the dried variety fresh pasta takes very little time to cook. Drop it into a large pot of boiling well salted water, and unfilled pasta (pappardelle, tagliatelle or similar) will cook in a couple of minutes. Filled pasta such as ravioli will take a minute or so more. You can also cook fresh pasta from frozen. Either way, the cooking takes just moments before you’re enjoying the great taste of the freshest of pastas. Serve with my carroty bolognese! If you try this How To Make Fresh Pasta With A Stand Mixer please tag #FussFreeFlavours on Instagram or Twitter. It is amazing for me when for me when you make one of my recipes and I really do love to see them. You can also share it on my Facebook page. Please pin this recipe to Pinterest too! Thanks for reading Fuss Free Flavours! 300 g plain flour preferably "00"
Add all the pasta ingredients to the bowl of your stand mixer. Using the dough hook, bring the ingredients together on the lowest setting. Then knead for about five minutes one or two setting faster, depending on your machine. Cover the bowl and leave the dough to rest for an hour. Cut into four, and flatten with your hand or a rolling pin until it will fit in the pasta attachment of your stand mixer. Pass through the pasta maker on the widest setting. Pass through again. Reduce the thickness setting of the machine, and pass through twice again. Repeat until you have reached the second thinnest setting (if making tagliatelle). If the pasta gets to be too long to handle, simply cut in half. 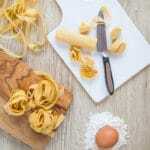 Roll and cut into strips with a knife, or slice using a roller tagliatelle cutter. Cook in a large saucepan of salted boiling water for about 2 minutes. Add your preferred sauce and serve. The finest milled "00" flour is best, but you can use any plain flour. The semolina is a nice addition, but not absolutely necessary. If not using it, measure 450g of flour. Fresh pasta can be frozen. Either roll, cut and freeze or freeze a lump of the dough. Rolled and cut pasta can bee cooked from frozen. Just drop into a large pan of salted boiling water.